Here’s a guide on how to Fix Microsoft Office Installation Error 30015-1015 to resume the stuck installation on PC desktop, laptop or tablet. If you are trying to install Microsoft Office but it get stuck in the middle, you are at the right place for fixing the issue. 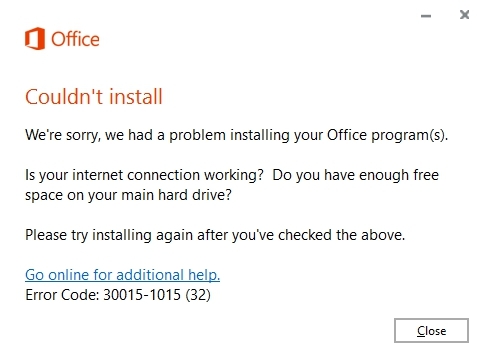 This Microsoft Office Installation error appears with the code 30015-2015 and occurs mostly when you try to install Office 365, Office 2016, and Office 2013. The complete Microsoft Office installation error code shows like this: 30015-1015 (32) during the installation process and shows that the program cannot be installed at the moment. Microsoft Office should install on your Windows device without any issue if there is no shortage of free storage and your device is connected to a stable internet connection. However, some third-party programs, app, or Windows Firewall could be conflicting with the Office installation process causing to stuck unexpectedly. See the instructions below to learn how to fix the issues to get Microsoft Office installation process back to working. Before proceeding, give Microsoft Office installation process one more go by trying to install the suite while keeping all other windows of active programs minimized. Too many open windows on the screen consume high memory and CPU, which may act as an hindrance during the installation process. Sometime when you uninstall a program or update it to a new version, some of the files related to the previous version don’t delete, which can cause create conflicts during the installation process of the new version. So, make sure you have deleted all the associated files with previous version of the Office tool before reinstalling or updating it on PC. This could be the reason behind error code 30015-1015 that may prevent installation process to complete successfully. Try Microsoft Office Uninstaller tool and uninstall it from your device including all related files from your PC. It will remove everything that belongs to the office program. Now, try installing the office suite again. Some third-party programs mostly, and Windows firewall occasionally, could be behind the Office installation error 30015-1015. Usually this error doesn’t appear when you try to reinstall it after uninstalling previously installed version along with all files that belonged to it. Disable third-party antivirus programs as well as Windows firewall and try installing the Office suite again. It will fix the error 30015-1015. Turn off antivirus or firewall to prevent them from clashing with the Microsoft Office suite. Enable clean boot on Windows device to automatically disable all third-party apps and services before installing the Office suite. This will activate a clean environment on Windows for Office installation and blocks any unwanted program interference during the installation process. Now install Microsoft office after clean boot, this should fix the error code. The methods mentioned above should fix the issue installation issue on Microsoft Office. If not, then, possible problem may reside somewhere else such as malware on PC has infected the Windows copy which may be causing the installation error. In that case, remove malware before starting the installation process. Or the problem could be with your PC’s hard disk, so fix hard disk issues before installing Microsoft Office. Another way to fix hard disk storage issue on your device is via chkdsk command method: Press Windows key + X to open Command Prompt (Admin). Type Chkdsk C: /f and hit enter. Now, hit the Y key and enter once more. Restart PC to complete the process. Or go to office.com and download the installer again, preferably from Microsoft Edge browser and install Microsoft Office again. This should fix the problem. If it remains, contact via comments with your office installation issue.